‘Tis the season for Goose Island’s annual release of their Bourbon County line of beers. With this year’s release, the product line has grown to include a barrel-aged English-style barleywine in addition to their very tasty imperial stout offerings. Beer geeks around the country are giddy at the thought that this beer could be of the same lineage as King Henry — many a beer geek’s White Whale. It’s been over a year since I’ve sampled King Henry, but if my memory serves me correctly, this is a relatively similar beer. Reviewed as a BJCP Category 22C. Wood-Aged Beer (English Barleywine base). Lots of big, sticky malt dominates the aroma. Most apparent on the malt side is a rich and luscious deep caramel as well as some molasses. There is a ton of pleasant oxidized malt character reminiscent of dark fruit and tart cherry — likely a consequence of the micro-oxidation that occurred while in the barrel. There is a surprisingly light oak character that has hints of vanilla and toasted coconut, which blend well with the base beer. Some hot alcohol is apparent, but it is minimal considering the high ABV. No hop aroma. Very deep mahogany — almost black. The beer is clear with a minimal tan head. This is an attractive beer, but a few shades too dark for the style. There is a richness to the malt that fills the palate with flavors of dark caramel upfront and toasty biscuit and bread crust on the back end. Again, there is lots of oxidized malt that comes off as raisin-like in the flavor. There is some definite boozy hot alcohol, which actually helps balance the heavy-handed malt sweetness. The hop bitterness is barely enough to balance the large amount of sweet malt. 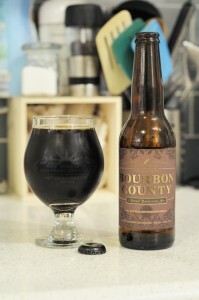 The bourbon flavor is definitely present, but not nearly as intense as other beers in the Bourbon County line. “Chewy” is a fitting description of the mouthfeel. The beer is slightly slick and leaves the mouth a bit tacky and sticky. The carbonation is very soft, which serves to enhance the full-bodied nature of this beer. The beer is a bit syrupy on the finish, which detracts from the overall impression of the beer. This is a big and intensely complex malt-bomb. If that’s what you’re in the mood for, this beer will greatly exceed your expectations. A touch more attenuation seems like it would help the beer out in terms of drinkability (if there is such a thing for a 12.1% beer). There are some prominent oxidized notes in this beer that are pleasant, but not something I’d want to enhance by aging the beer any further. This would work well as a dessert beer or replacement for something like a Sauternes paired with a Roquefort cheese. Last spring, I serendipitously had the chance to try Lawson’s Finest Double Sunshine while on a beer pilgrimage up to Vermont. Sitting on the sunny deck of The Reservoir in downtown Waterbury, the stars aligned — by pure luck, I happened to be seated for lunch at the very time that Double Sunshine was being tapped. In this case, the perfect atmosphere, company, and beer aligned to build a wonderful experience greatly exceeding the sum of its parts. The beer was absolutely fantastic and ever since I’ve been eager to try another of Lawson’s hoppy offerings. 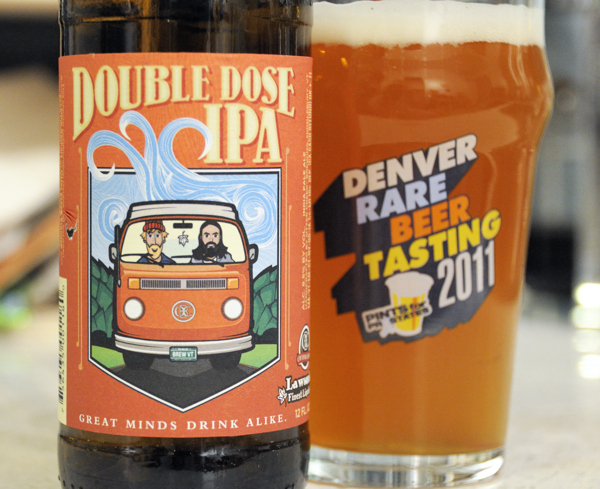 Luckily Lawson’s Finest has teamed up with Otter Creek Brewing to produce a collaborative IPA called Double Dose. Thanks to Otter Creek’s distribution capabilities, a good amount of this beer made its way down to NYC and I was able to get a 4-pack. Judged as a BJCP Category 14B American IPA. Big in-your-face hops hit you as soon as your face nears the glass. Tangerine, pithy grapefruit zest, a very light hint of pine resin, and a substantial amount of ripe mango dominate. The intensity of the hops is quite high, but in many ways feel a bit muddled. There is just a hint of malt aroma. Some hot alcohol is apparent. Very muddy and hazy. The beer paints a golden hue, which turns somewhat brown due to all the suspended solids. Head is bright white and persistent with tight creamy bubbles. Citrus fruit dominates the flavor with a touch of pine sap. There is some very light crackery malt and maybe just a touch of sweet caramel. The bitterness is fairly moderate at first, but transforms into a fairly coarse and abrasive bite on the finish. The finish is further disturbed by a fairly substantial amount of hot alcohol. The beer is medium to medium-full bodied with a very distinct creaminess that is very reminiscent of Heady Topper to me. The beer finishes too full to fit well stylistically into the IPA category. This is a nice example of an IPA that pushes, and likely exceeds the bounds of what most people would consider a standard IPA. I would be much more inclined to call this a double or imperial IPA. I enjoyed the hop intensity, but couldn’t help but think that the recipe could benefit from some hop varietal editing in order to allow individual flavors to pop on their own. Additionally, I found the amount of very apparent alcohol a bit overwhelming. I enjoyed this beer, but not nearly as much as my last Lawson’s experience. The nature of the craft beer movement encourages trends. 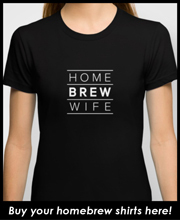 Currently, it seems that collaboration beers are all the rage. Stone does it all the time (even with homebrewers) as does Russian River, Deschutes, Hair of the Dog, and many of the greatest breweries in the country. Super IPA is a collaboration between one of the biggest craft brewers (New Belgium) and one of the smallest and most sought after (Alpine Beer Co.). At first glance, this seems like an amazing opportunity for a small and critically-acclaimed brewery to get distribution well-beyond their typical geographical influence. Unfortunately, while quaffable, this beer misses on many marks which would have made it amazing. 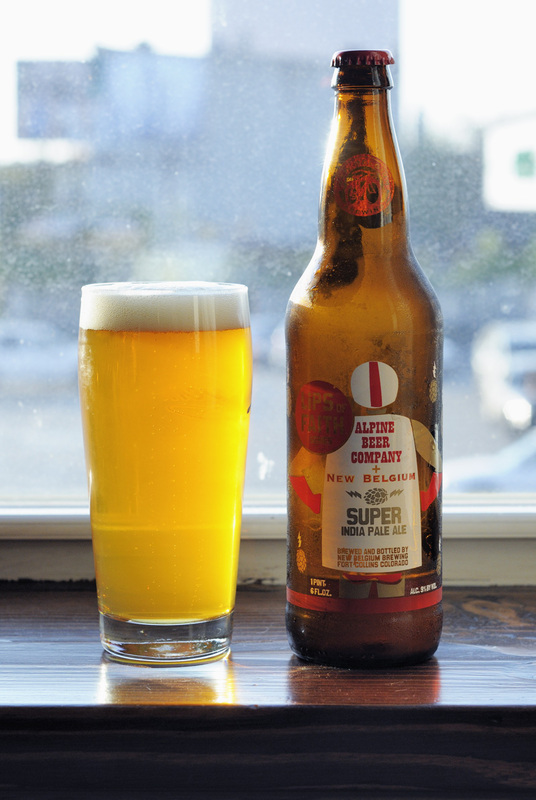 The Alpine Beer Co. and New Belgium have come together for the love of IPAs. This collaboration is hop-wonderful with Amarillo, Columbus, Simcoe and Centennial hops, bringing the bitter all the way to the front. A nice balance is present with Pale, C-80 and Carapils malts, but the tropical and citrus tones of the American hops dominate. 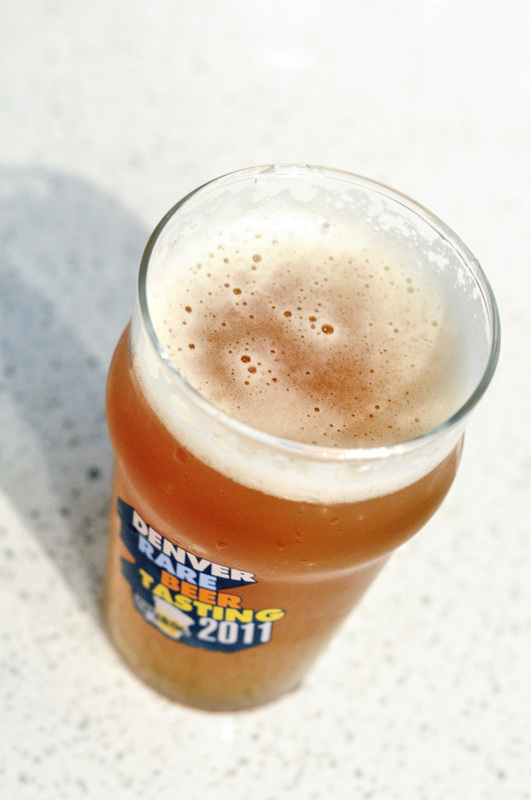 This Super IPA pours a sheened copper and carries a bright, white head. Consider yourself a hero for getting an Alpine beer outside of San Diego. Note: Evaluation done according to BJCP Scoring System. This beer was reviewed as a Category 14c. Imperial IPA. In spite of my limited tenure in New York, I can already tell it is an exciting time to be a beer lover in the city. It seems like each new day brings news of yet another brewery distributing to the state. It is hard to keep up, but my liver is trying its best. When I saw that Bierkraft had tapped several kegs of Dark Horse beers, I hustled on over for a reasonably priced growler fill. Dark Horse has gained some following outside of Marshall, Michigan and I am excited to try the beers they send my way. Inspired by West Coast I.P.A.’s, but brewed with Michigan style. The Crooked Tree is heavily dry hopped to give it a big aroma of pine and citrus. 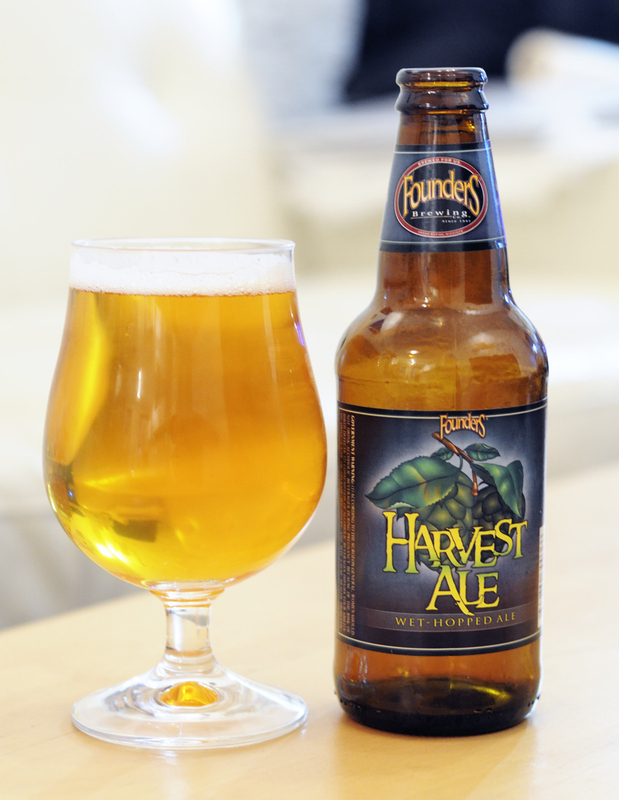 The flavors are big, yet very balanced between fresh hops and malt. Often described as “grapefruit” our hops give this beer an excellent fruit flavor that finishes dry, crisp, and clean. It will pour a nice deep copper color with a bit of haziness. Because of our almost patented “Intense Transfer Methods” our Crooked Tree has won several medals in the India Pale Ale category. Note: Evaluation done according to BJCP Scoring System. This beer was reviewed as a Category 14b. American IPA. When it comes to fresh (wet) hopped beers, I am a very difficult consumer to please. The majority of wet-hopped beers I’ve tried have a distinct ‘dirty’ flavor that I do not enjoy. It is a flavor that is hard to describe, but one I chalk up to the massive amount of raw plant material that tends to go into these beers. For lack of a better word, I tend to call it chlorophyll-like. Some people like this flavor, but I tend to enjoy bright, clean hop flavors. Founders managed to impress me with this beer by avoiding a lot of the flavors I find rough or harsh in wet-hopped beers. This liquid dream pours a hazy golden straw color with a white, two-finger head. Your first sip rewards you with a super juicy hop presence bursting with fresh citrus, then finishes to introduce toasted malt undertones. Note: Evaluation done according to BJCP Scoring System. This beer was reviewed as a Category 14b American IPA.